Looking back at my childhood, my mom did an incredible job of making the Christmas season so fun and magical for all seven of us kids (and she did it without the help of the internet, h-o-w). I loved everything about the holidays and have such fond memories of Christmas eve, Christmas morning, and loads of traditions surrounding the season that left a lasting impression on me and my siblings. As an adult, you'd think I'd be up for carrying the torch but I'm going to admit that this is my first year as a mom that I haven't felt completely overwhelmed by the holidays. Chalk it up to Simon's improved (much!!!! improved) schedule, and the fact that we really don't have a baby in the house anymore but I'm finally feeling ready to climb out of lameland and get the Christmas party started - albeit a small party but a party, nonetheless. 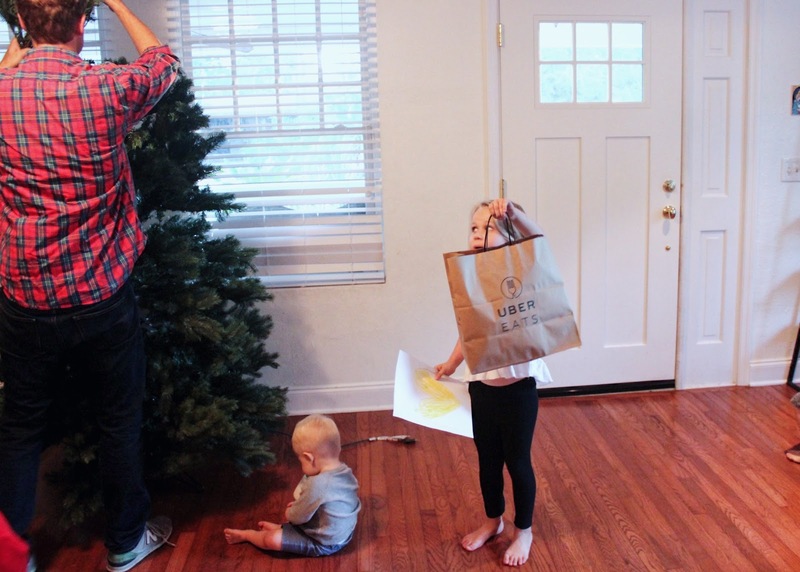 We started simple this past weekend with an evening of tree decorating. In lieu of a family drive out to a picturesque tree farm we pulled our old artificial pre-lit faithful out of the closet hidden behind all of our beach gear and went to work. To make the night feel extra special for everyone (especially me) - we ordered food to be delivered - something we NEVER do (not even pizza - what's wrong with us?). I don't know why we don't because it takes the horror out of restaurant trips with kids (Simon has even nixed fast food visits with everyone after a recent trip and I wholeheartedly agreed with his mandate) and it's an easy way to try new spots without the hassle and cost of getting a sitter. We had the fun opportunity to try UberEATS for the first time ever and I'm afraid they've created little UberEATS addicts out of us Pattons. Nothing's going to deter Simon from his faux fluffing. Also, I thought it was cute that Simon came out wearing a holiday-ish shirt for the festivities. I had never heard of UberEATS so in case you're in that same boat, UberEATS is basically an Uber for your food. UberEATS delivers food from hundreds of local restaurants - fast! The average delivery time is 35 minutes from start to finish and you can track your order and driver on the easy-to-use app. The kids were talking about putting the tree up AND ordering restaurant food alllll day long (starting at 5 something am) and the evening did not disappoint. We ordered sushi for me and Simon and the kids got pizza and pasta galore. The UberEATS app lists how long it will take each restaurant to have the food ready and delivered but both drivers came about 20 minutes earlier than predicted (estimated at 45 minutes but came after 25 minutes) which was a pleasant surprise. Eating in the living room - an annual treat. The kids trying (and tolerating) edamame. For the whole month of December UberEATS is offering free delivery for orders over $50 and the first fifty people will get $10 off their first order with code: PATTON10. And so, our first (and only, thus far!) Christmas tradition was born. It was simple but the kids had a blast and I enjoyed the break from cooking and Simon enjoyed the break from the dishes - win/win/win. Thanks for reading and a big thank you to UberEATS for sponsoring this post! Is this another haircut you did yourself??? It looks stylish! ...and I wish I knew how to do it! I think making Christmas special was easier before the internet. Now there is so much pressure to make everything Pinterest worthy. We tend to feel inadequate. Even if we aren't. a) your hair looks great and b) i want to try ubereats. I'm curious about your mom's traditions. Of course, to try to borrow. Though I'm in the realm of very low expectations so mostly I just want to dream and look forward to when the babies are older. Looks like a great time. Are you like me and let the kids decorate the tree only to rearrange everything after they go to bed?